I should have known better after the Santa Claus debacle, but apparently I hadn’t learned a thing because less than four months later there I was in an Easter Bunny costume. I have absolutely no idea how they talked me into it, honestly. All I know is that one day my boss was hinting around about having something special planned for Easter, and the next he was showing me this giant head. And boy was it heavy! Just to get you back up to speed, I was working for the Philadelphia Vision Center during my senior year of high school handing out flyers in the outlying neighborhoods in the general vicinity of the Vision Center in Southwest Philadelphia. In addition to handing out those flyers, they had co-opted me into being Santa Claus for the previous holiday season, a thankless job with a beard that itched more often than not. So, there I was looking at a giant head that probably weighed more than a bowling ball, and I was honestly considering it. For starters, they were going to pay me more for it, to the tune of a couple more bucks per hour, and I wouldn’t have to deliver flyers for two whole days. You see, there was some type of bazaar in a local school gym where all manner of businesses were invited and given tables to advertize. It was engineered as this amazing revitalization of the community and local business, although the local aspect of each business was debatable. It was for two days, the Thursday and the Friday before Easter, and the Vision Center had been invited. Thinking back on it, I think the only reason we were invited was because of that Santa thing I mentioned earlier. 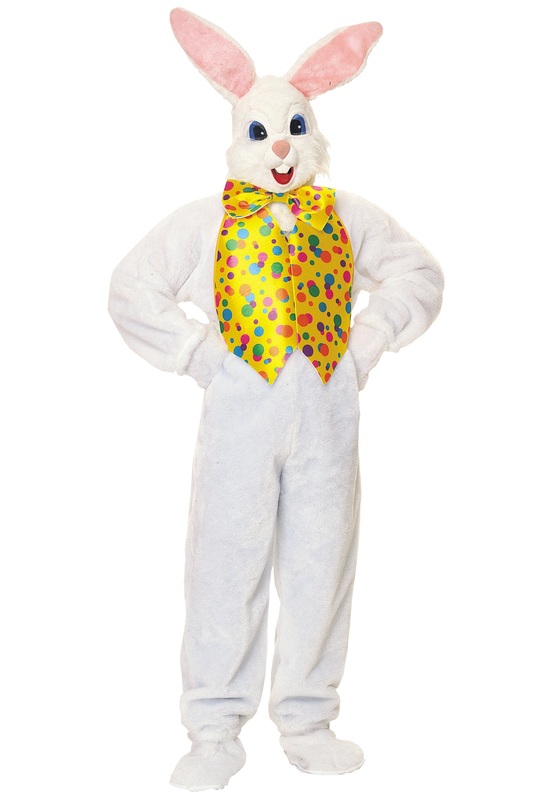 My best bet was that the community action folk decided we would be the most probable to have an Easter Bunny costume. Go figure. And of course the getup required someone relatively tall to fit into it. Enter me. The dunce. The bazaar was six hours on each day, and I had to be there (and in costume) early. They had to send someone else along in order to help me put it on and take it off, which was going to make it doubly difficult to use the bathroom if, heaven forbid, I had to go. I found out earlier in the week, too, that the flyers printed out for the event said that kids could “take a picture with the Easter Bunny,” and I knew then that I would be forced into service that way too. Somehow I actually showed up on the first day with costume in bag to the school. My partner met me there and helped me into the costume. It was stifling in there from the very start, and I was already regretting my acquiescence. I tried to remind myself about the couple of extra bucks every hour as the head was positioned over my own and I swayed before straightening up with the strain of it. No one told me ahead of time, either, that I couldn’t talk because the eye holes were in the bunny’s chest and we didn’t want to scare the children, so I was going to be a mime. Glory be. The paw gloves that fit over my own hands were too bulky for me to carry anything, so my partner was handing out the flyers while I was supposed to just wave like an idiot (or a politician, but I’m being redundant), and take random pictures with kids. Yeah, it was a long day. By the time the first day was over I was soaked in sweat, I had to remove the costume twice in order to use the bathroom, and my eye holes weren’t quite lined up so I was bumping into things when I tried to walk. My hair was plastered to my head (I had an afro back then) and I looked really stupid heading back home. Oh, and I had also taken about 50 photos with kids who did not seem too excited to be having their picture taken with the Easter Bunny. The worst part was not being able to talk all day. There was absolutely no way I was going back to do it again the following day, no matter how much money they threw at me. But there I was bright and early on that Friday, donning the same costume and putting on that massive head. Apparently I’m a glutton for punishment. Needless to say, that day was worse than the first, the kids were ornery instead of just complacent, and my feet were stepped on numerous times. Let me tell you, just having those bunny slippers on wasn’t so helpful when they get stepped on, and holding back from swearing took more energy than I probably had. In fact, about an hour into that second gig, I had to have my partner bring me a chair because I began swaying back and forth, probably from a bit of heat exhaustion. I swore there and then that what I had just been through was a unique kind of torture that would never be repeated, no matter how hard anyone begged. Oh, and finally that was a promise I kept. 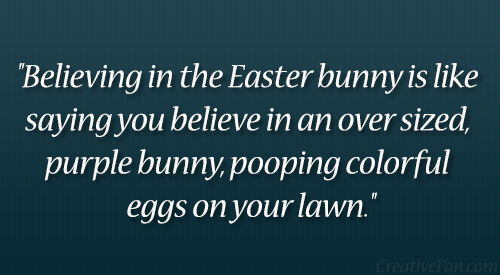 I haven’t been the Easter Bunny since. Luckily for me, that was the only job that even remotely asked me to be any childrens’ hero. And thank God for that. I honestly don’t think I could fit into those Tooth Fairy tights if my life depended on it. Now that’s funny! You never hear the behind scenes accounts of people who dress up in these costumes. It was hotter than a Swiss sauna in there! Lol! Your story did a great job of describing that.